Deferred Consumption: The US is a low tax, relatively unequal country, yes? 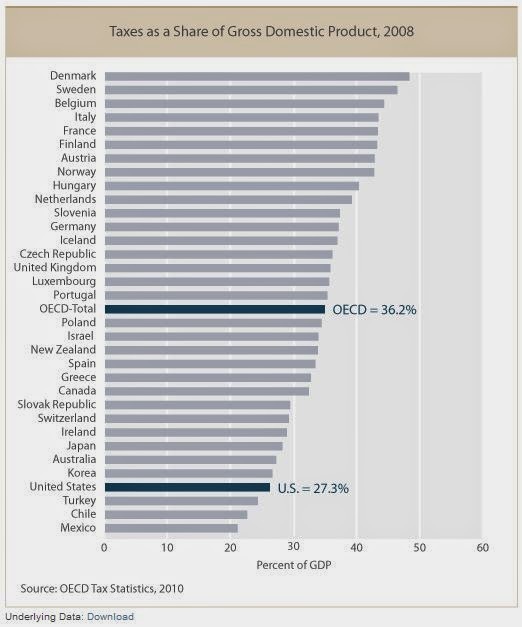 The US is a low tax, relatively unequal country, yes? I got into an interesting discussion on Twitter today about whether conservative economic principles increase or decrease income inequality in the US. This surprised me, as I didn't think conservatives touted their policies as necessarily decreasing income disparities. Recall the whole rising tide lifts all boats mantra. The whole point of debate, I thought, was whether the Republican policies of high growth at all costs was worth the inequality that came with it. To back up my understanding here, I'll present a couple figures showing that the US is actually a relatively unequal country (in economic terms) and that we're a relatively conservative country (in terms of tax rates). Here's a comparison of income disparities across developed countries in 2010 using this OECD report. Note that higher Gini coefficients mean greater income inequality. So out of these thirty-four countries, the US is number thirty in terms of income equality (according to the Gini coefficient). More clearly, in the US those in the top 10th percentile on average make ~17 times more than the average of those in the bottom 10th percentile of income (right axis). Note that this ratio is only around 6 for many European (especially Nordic) countries. Note that, just as the US was one of the more unequal in terms of income, it is also has some of the lowest taxes of any rich country (not coincidentally). Note how we are grouped with Turkey, Chile, and Mexico in the low tax and high inequality regime, whereas the Nordic countries (and Europe in general) has opted for the higher tax and lower inequality model. This isn't me passing judgment. It's just the state of things. The US has accepted higher inequality as the price it pays in its attempt to achieve more economic growth. The question of the decade, however, is if those higher growth rates are materializing and making everyone better off. We'll look at this tomorrow.